Dedicate a garden feature to a loved one or organization. 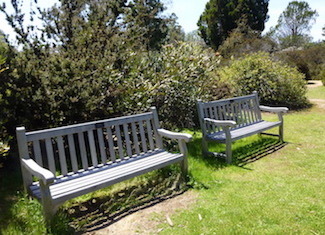 Gifts of tribute benches help the UC Santa Cruz Arboretum & Botanic Garden maintain its diverse living museum of rare and endangered plants, further the conservation of plant diversity, and promote understanding and appreciation of plants and the natural environment. Benches are a wonderful means of passing on a love and respect for nature to future generations. Tribute benches are $5,000, and are tax deductible. For more information, contact Amber Burke, Development Director, at (831) 502-2303 or aburke1@ucsc.edu.